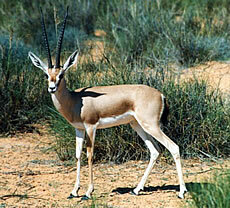 The slender-horned gazelle is found in sandy and stony desert lands of Algeria, Egypt, Sudan, and Libya. It has a slender body with long legs, its coat is a light fawn color, and its underparts are white. Its horns are long and slightly curled. Head and body length of adults is 30 to 65 inches, shoulder height is 20 to 40 inches, and its tail can reach up to ten inches. Slender-horned gazelles have large ears and a good sense of hearing and vision for detecting danger. Males are larger than females, and adults can weigh up to 66 lb. The slender-horned gazelle is well adapted to sandy dunes and rarely needs water. It can obtain all of its water from the plants it eats. Diet consists of grass, succulents, herbs and foliage of shrubs, and it prefers to feed during the night and in the early morning. This species prefers to live in groups of up to 10 individuals, and some combined groups of up to 30 have been observed. Breeding occurs mostly in the wet season, but can occur year-round. The female gives birth to only one calf after a gestation period of 120 to 220 days. The slender-horned gazelle population is said to be dangerously low and the species is on the verge of extinction with only about 1000 individuals remaining in the wild. Hunting is the main cause of decline. Its horns were formerly sold as ornaments in North African markets and shops. Habitat loss and warfare have also contributed to the decline of the species. Copyright Notice: This article is licensed under the GNU Free Documentation License. It uses material from the Wikipedia article "Rhim gazelle". Glenn, C. R. 2006. "Earth's Endangered Creatures - Slender-horned Gazelle Facts" (Online). 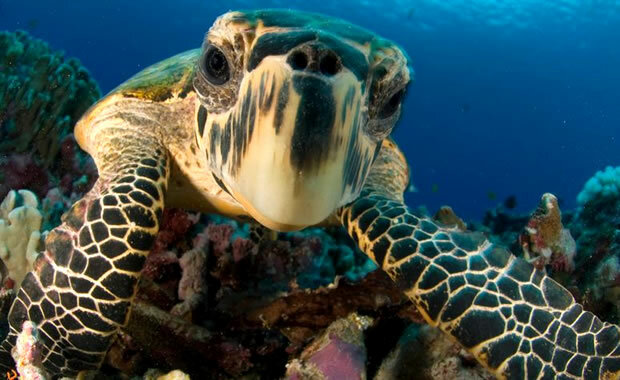 Accessed 4/24/2019 at http://earthsendangered.com/profile.asp?sp=170&ID=1. Need more Slender-horned Gazelle facts?